NAIROBI, Kenya/APO/ – Kenya’s transition to a green economy could produce major economic benefits – equivalent to an estimated USD 45 billion by 2030 – as well as greater food security, a cleaner environment and higher productivity of natural resources, according to a new study launched Tuesday by the Government of Kenya and the UN Environment Programme. 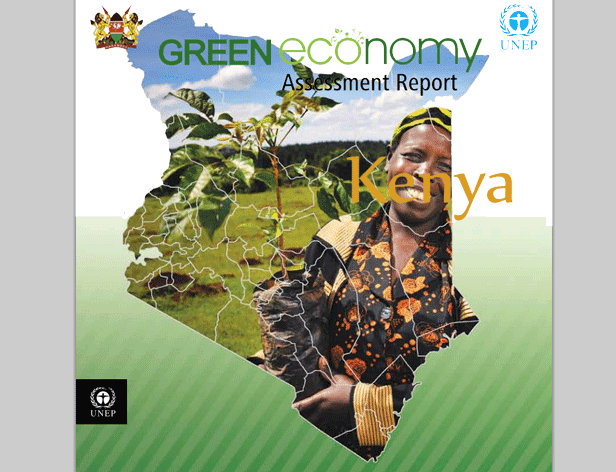 The Green Economy Assessment Report: Kenya finds that the transition to an inclusive, low emission , resource efficient green economy will result in stronger economic growth and increased wealth creation opportunities by 2021. Under a green economy scenario, with an investment of two percent of GDP, national GDP would exceed a business-as-usual scenario by about 12 per cent, or KES 3.6 trillion (equivalent to USD 45 billion), by 2030. Per capita national income would nearly double from KES 39,897 (USD 498.70) to KES 69,702 (USD 871.30). Under a business-as-usual investment scenario and a two per cent investment, GDP would only increase to KES 53,146 (USD 664.30) over the same period of time. As green economy measures mitigate the impact of climate change, the report finds the country’s aggregated Green House Gas Emissions measured in tonnes of carbon dioxide equivalent would be 9 per cent lower by 2030 under a green economy scenario with an investment of two per cent of GDP compared to a business-as-usual scenario and a two per cent investment. In the agriculture sector, the report finds that green economy investments would increase the average agriculture yield by about 15 per cent from its current baseline. Agriculture accounts for approximately one quarter of Kenya’s national GDP annually and up to 65 per cent of its exports. Green Economy driven by resource efficiency is the basis for sustainable development and poverty eradication. A green economy revolution is already taking place in Kenya, where the harvesting of geothermal energy from the East African Rift is just one of the many renewable energy projects underway across the country. By learning to more accurately value our own natural resources, Kenya will be able to better harness these strategies as it moves towards a holistic, inclusive green economy in the future. Kenya is already implementing policies and initiatives to move towards a green economy, and this approach is recognized in the country’s long-term development blueprint and in the government’s Second Medium Term Plan (2013-2017). The report finds that further green energy investments could lead to about a two per cent reduction in energy consumption and an expanded supply of electricity from renewable sources compared to business-as-usual. For example, under a green economy scenario, renewable energy would double geothermal capacity by 2030, compared to business-as-usual, and other renewable energy resources would also grow during this period, contributing to 20 per cent of the total power supply. To accelerate these efforts, the report urges the government to consider adopting targeted clean energy solutions for households and institutions, such as energy efficient lighting and appliances; and, making additional investments in renewable energy, such as geothermal, solar, wind and biofuel energy. While Kenya’s manufacturing sector has continued to contribute about 10 per cent to the country’s GDP for over many years, it is still one of the largest in Sub-Sahara Africa and considered a key pillar for the country’s future growth. However, the report finds that to green this sector, more public policies are needed to encourage and incentivize investment in resource-efficient and clean production processes, recycling and eco-labelling, among other transformative strategies. The country’s transport sector is also critical to its green economy goals. This sector is expected to triple between 2010 and 2030, and vehicles on the road have already doubled during the last decade. To better regulate this sector and reduce emission of harmful gaseous pollutants, the report suggests that the government needs to create incentives to lower the age of its passenger and freight fleet, as well as promote more mass transit and non-motorized transport . The next wave of investment and innovation in Kenya will be driven by the need for new energy sources, wealth generation and job creation. Kenya is already demonstrating leadership by pioneering green economy approaches in the energy, urban and natural resources sectors as a vehicle to deliver its national development goals. This report confirms that the country can achieve even greater prosperity and well-being by scaling up its green investments in key sectors, while also factoring the conservation and efficient use of its natural capital into future decisions related to infrastructure, investment in the development of the energy, transport, agriculture and industry sectors. UNEP supported a consortium of Kenyan institutions that formed the “Inter-Ministerial Committee on green economy” to lead the green economy in the country. The Committee comprised members from various government ministries and the private sector organizations. The report, which examines the economy-wide impacts of green investments under different scenarios, reveals that positive returns could be realized within seven to ten years.